Oliva - Monne Cigar Co. The Monett (also referred to as Monne) Brother’s; Evaristo and Robert built this 3-story 32,800 sq. ft. cigar factory building designed by C. E. Parcell in 1888 to house their Monett Cigar Co. It is one of only two remaining wood-framed cigar factory buildings in Tampa, the other being the Salvador Rodriguez factory building in Palmetto Beach. The building housed the R. Monett & Bro. Co. from 1888-1899, the Cuban Manufacturing Co. between 1899-1902, the Jose Lovera & Co. between 1902-1921, the Nordacs Cigar Co. between 1924-1925, Marcelino Perez & Co. between 1926-1941 and the Lopez, Alvarez & Co. from 1947-1960 who reportedly manufactured the Swann Cigar brand under contract. It was the Oliva Tobacco headquarters from 1980-1999 and was later used as a warehouse for the Oliva Tobacco Company whose offices are at the Garcia & Vega factory building in West Tampa. A history of the building and the "Home of Swann Cigars" painted on its front can be found on this March 13, 2015 article in the Tampa Tribune . According to this article, the building will be home to 38 apartments when complete and be named “The Angel Oliva Sr. Building” after its longtime former owner and tobacco distribution giant. Originally, the 50 x 200 foot structure at 19th Street and Palm Avenue had seven windows across the front and approximately 28 on each floor along the north and south sides that provided ample light for the factory’s workers, typical characteristic of cigar factories in those days. As can be seen from the pictures below, at one point in time the number of windows on the side were substantially reduced by the installation of siding. The second set of pictures taken January 2017 show the original number of windows on the North side. 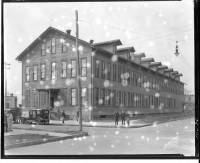 The building utilization followed the typical use in most all cigar factory buildings in the area; the first floor contained offices with the rest of the floor space available for the packing department, rolling took place on the second floor where there was room for 1,200 rolling tables and a stripping department and drying racks were located on the third floor for sorting and selecting the tobacco blends. Separate additions were built for the warehousing and casing of the tobacco bales.